Marantz UD9004 review | What Hi-Fi? We've seen premium Blu-ray players before, but never one as costly as Marantz's new UD9004: this £5000 'Universal' player, able to spin Blu-ray, DVD-Video, DVD-Audio, SACD and CD, is rivalled in scale, price and build only by Denon's equally substantial DVD-A1UD, which we've yet to test. Now we fully understand that some of you will never come to terms with the Marantz's huge pricetag: even some within our own ranks found it an almost insurmountable obstacle, regardless of the UD9004's considerable talents and desirability. So let's address the thorny issue of value head-on: while we're confident this is one of the finest Blu-ray players we've tested, it'd be fair to say that it isn't five times better than the best £1000 decks, such as Sony's exceptional BDP-S5000ES. But listen to it, spend time with it, enjoy what it has to offer, and such simplistic value judgements simply cease to be relevant. Fact is, the UD9004 is more than good enough to satisfy the needs of the fortunate few willing to spend this much money on any audio/video component. In fact, it's one of the most talented Blu-ray players we've tested yet, chiefly because aside from its considerable movie talents, it's also a superlative music source. And that, of course, is precisely what Marantz set out to achieve with the UD9004. Although fully fettled to meet the latest standards in Blu-ray – unlike many high-end designs, it's Profile 2.0 enabled, complete with an Ethernet port and a SD card slot to provide the necessary memory capacity for BD-Live downloads – the Marantz looks and feels more like a high-end CD player. It's huge, its massive 19.2kg chassis dwarfing most Blu-ray contemporaries: lavishly machined slabs of zinc, copper, aluminium and steel abound, each material combining to deliver the optimum durability, stability and interference-rejection. Every fascia button feels fit to last a lifetime's usage, and as is typical of products in this price class, the disc-loading mechanism operates in serene silence, providing eloquent testament to the thorough – and thoroughly expensive – engineering lurking within. 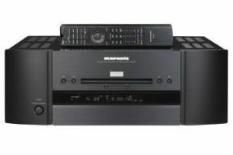 Internally, the UD9004 is hi-fi-like too, its design sharing audio circuitry and key components with Marantz's superb SA-7S1 SACD/CD player, including a three-section, copper-plated chassis that separates audio, video and power circuits to cut down on internal interference, HDAM-SA2 amplifier modules for all channels and a gigantic toroidal transformer encased in its own copper shroud. No expense has been spared in digital decoding or processing, either: the UD9004 features twin 32-bit SHARC chipsets for accurate multichannel audio decoding and processing, plus top-spec audio 32-bit/192kHz audio DACs from AKM for both stereo and surround use. Output terminals are predictably extensive too, the Marantz featuring dedicated XLR-outs for stereo listening, plus 7.1-ready RCA analogue outs to support its onboard decoding of DVD-Audio and SACD (in stereo or multichannel) plus all forms of DVD-Video and Blu-ray audio. It can even be configured to deliver HDMI audio and video signals separately should you wish, thanks to its twin HDMI outputs – so you can run pictures (and only pictures) directly into a projector, with audio (and only audio) going to your AV receiver, in theory to the benefit of sound quality. It'd be a surprise, after all this build-up, if the Marantz didn't deliver the sonic goods, but it does – in spades. As we said, it's a superlative music source, its balance sounding uncannily similar to the audio-only SA-7S1. Connected via XLR connectors into our reference system, the UD9004 is composed, assured, effortless and genuinely delightful: it polishes the top-end of some harsher discs, for sure, but never at the expense of accuracy or absolute detail. Interestingly, switching to the RCA connectors helps address that a little in our reference system. With SACD, voices have outstanding character and presence, as Dylan's endlessly memorable Sad Eyed Lady Of the Lowlands gloriously highlights, and even a brasher, punchier CD poses few difficulties, the Marantz thundering through The Prodigy's frenetic Warrior's Dance with formidable depth and infectious power. Only timing leaves us with any cause for concern, although it's certainly not poor – just not quite as razor-sharp as the best Cyrus has to offer. But by way of compensation, the Marantz offers a crucial advantage over its British rivals, and over most other high-end CD player rivals – it can play Blu-ray discs, too. And it can do so to a very high standard. Aided by 14-bit/297MHz Analog Devices video DACs and the widely revered Silicon Optix Realta HQV video processor, the UD9004 is able to conjure a wonderful picture, with a lustre and depth that eclipses even terrific Blu-ray players such as the previously Sony BDP-S5000ES. With Blu-ray discs such as Wolverine and The Dark Knight, the Marantz's picture is blessed with glorious richness and variation in texture, while even older, less-spectacular DVD transfers are stable, crisp and appropriately polished. Film sound is equally striking, whether you decode onboard to the Marantz's analogue outputs or stream audio digitally via HDMI: in every sonic aspect, from detail retrieval to realism, steering accuracy to sheer power, there's much to admire here. We began by acknowledging that some of you will never be able to come to terms with the Marantz's pricetag, and we can't conclude without covering that ground once again. You'll have noticed how much of our review has focused on the UD9004's musicality, and with good reason: we've come to the conclusion that the Marantz isn't so much a high-end Blu-ray player able to play CDs as a high-end CD player able to play Blu-rays. And judged on those terms, it's a spectacular achievement: in essence, you're getting a Marantz SA-7S1 plus a top-quality Blu-ray player thrown in for free, and all in one (admittedly big) box. If you can afford it, it's well worth the money.